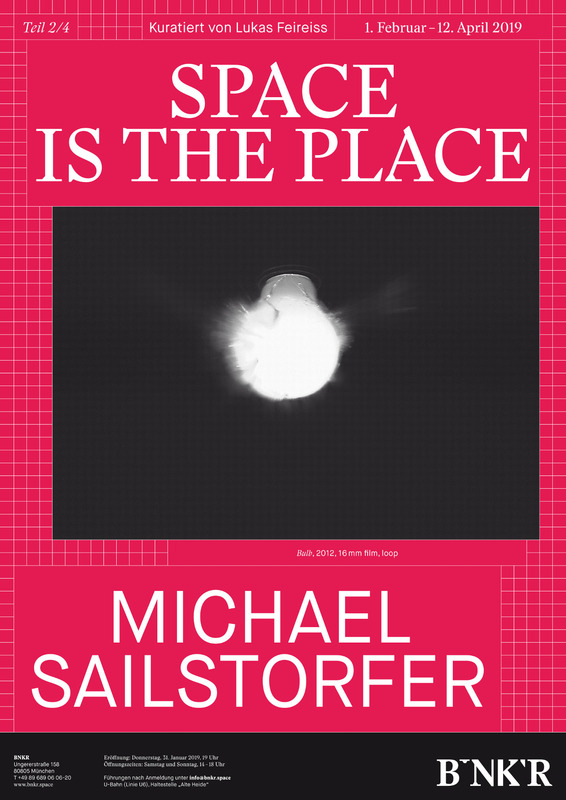 On the occasion of his current solo exhibtion under the title SPACE IS THE PLACE (Part 2/4) an exhibtion cycle 2018-2019 at BNKR conceived by Berlin-based curator Lukas Feireiss, we would like to put the spotlight on Michael Sailstorfer. 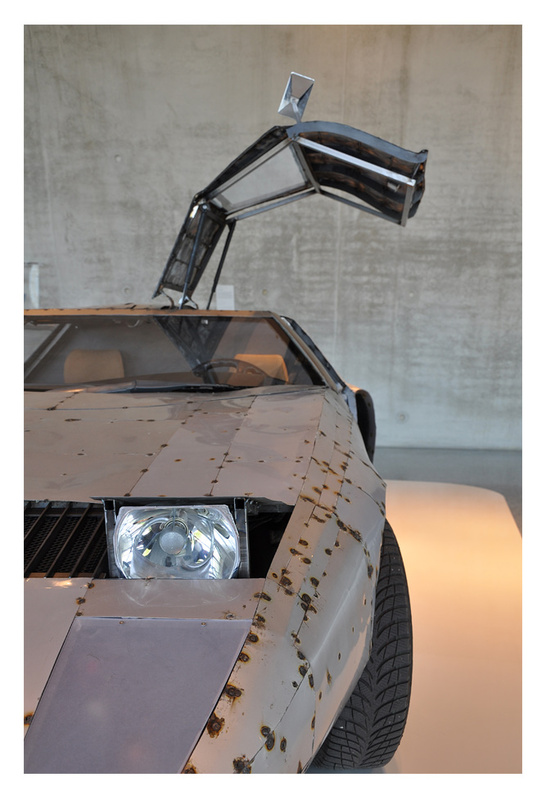 In 2018, we had the pleasure to talk to Michael about various projects for the VEHICLE issue at KÖNIG GALERIE Berlin. "I wanted to work with that particular space and transform it to something different. 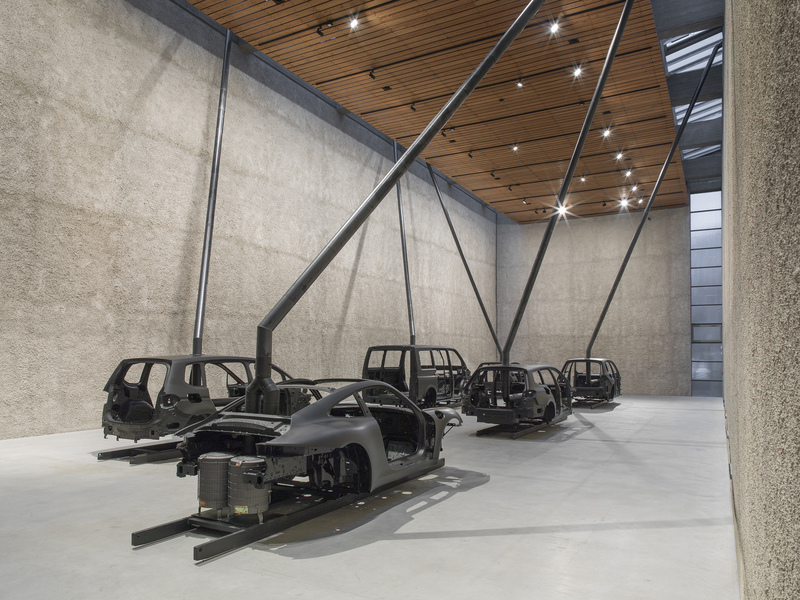 From my perspective the main hall of this Brutalist church that was designed by Werner Düttmann - now turned gallery space - has a similar vibe to an industrial manufacturing facility. So it’s exactly this sort of theory of thought that I wanted to incorporate into the exhibition, thereby turning the church into a factory like sphere. You’ll notice how the cars are lined up as if they were part of factory assembling lane. Further the exhausts are in use, thereby suggesting some genuine type of production activity resulting in the known negative impacts such as pollution and greenhouse gasses. The other constituent that was crucial to express is this impression of traffic. The idea of a complete standstill - about working time spent on the highway - the moment of standstill in movement. It’s about utilisation of resources and lastly about utter & complete congestion. There’s no way further. All that’s left standing are these auto bodies, a vivid impression of a post apocalyptic realm. Then there’s of course the aspect of heat development that gradually begins expanding throughout the space, gradually enveloping the entire space. And it’s due to this sort of physical experience that the observer gets drawn into the happening. I’ve personally lived through moments in which warmth & heat posed an actual threat too, it’s in those instant that you realise that there’s no escape. So of course themes like climate change incidentally also factor into the whole thing." I saw that you also built a Vespa before? Yes, I’ve also done that, I called the piece “Oven”. 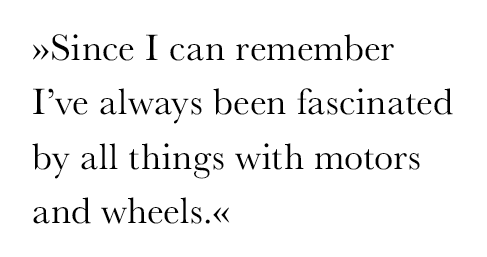 Since I can remember I’ve always been fascinated by all things with motors and wheels. So at the tender age of thirteen or fourteen I built & tuned Vespas. It was always a complete blast to get one and totally remodel it. There are definite parallels but of course on a much smaller scale. Exactly - they were all black and sometimes also varnished with durable colour, thermoplastic paint. Which of course looks pretty amazing - almost like graphic paintings in this room totally surrounded by black cars. That in itself is already very minimal. Are galleries showing interest for this sort of objects & are they being sold? Yes, they are being sold separately, for example in the 08 Exhibition in Peking. Three of them were in Scotland as part of a foundation, let’s say they were travelling quite a bit. Surely that wasn’t the commercially most successful move. But in the end it was more of a personal affair, a labour of love on my side to organise a show there. Surely it wasn’t the galleries most favourite exhibition, but I feel it’s necessary that these sort of projects also happen. Yes, I also completely financed it myself. Really? I thought that was assumed by the Volkswagen AG. Exactly, so first the concept was born. There was this scrapyard where I used to go and salvage some parts. So I called them & they offered for me to buy a couple old cars that I could then sand down. But I thought it would be much better if the cars were actually new - straight from the factory. So I started phoning some car manufactures - BMW, Volkswagen. Volkswagen was immediately onboard to supported me. I thought that was really great & then they send over the chassis & I reconstructed it and lacquered it & so on and so forth. And the Porsche was quickly sold, I guess? Yes sure, of course that one was sold. In case of Mercedes it was really the C111. Lastly it’s no less than an utopian car - what was initially a Mercedes design study became a mid-engine lay-out series that was launched in the late 60s during a car showroom event. The result being many blank cheques and preorders but in the final outcome it was it was never built because the production was way too cost intensive. I had known this car since I was little kid, even had the Matchbox edition, already back then it was an icon. So I had a request from VW and a commission from Mercedes to create a piece for their exhibition. Basically an homage to the C111. At that point in time my grandfather owned a 190 Mercedes - a regular model & I was allowed to have that one. So I was thinking - sure why not let me take my grandpa’s car and turn it into a C111. So razed off sheet metal siding, so that you could see the chassis & the motor. Everything was completely identical to the to the 190 & the B124 series. Then I went to Mercedes to measure out the C111 Prototype and reconstructed the chassis with the 190 type sheet metals, so we spent about four weeks of welding and then the car got picked up. The car actually functions. Now it’s part of the Mercedes collection & also spent some time in the Stuttgart Museum. We even took it for a spin on Mercedes’ test track, there’s footage of that as well. Of course he doesn’t live up to the usual horsepower standards with its hinged doors etc. But yeah - it still was a hell of a ride. So that was basically the 190s sheetmetal repurposed? Exactly - we basically stripped it all down, cut it into tiny pieces and then welded it back together as best we could & folded it into the desired form. Then we took the lights, switched them around and mounted them. We made our own flap headlights out of the classic fortnights. Whatever we could repurpose we utilised for the other chassis. And it totally drove just fine. 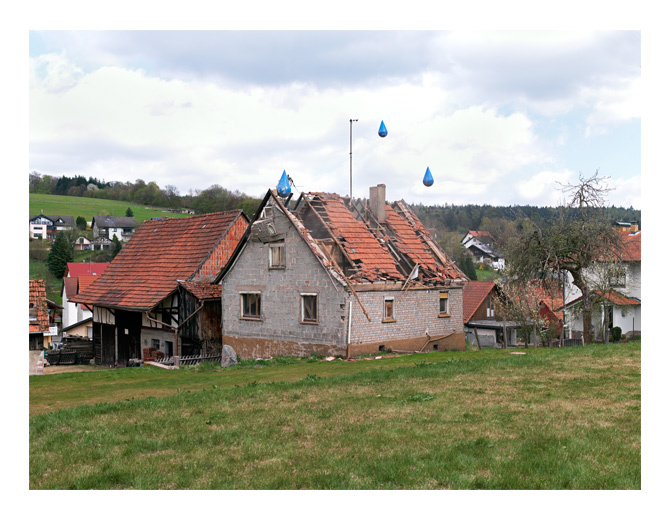 The tank was part of a 2007 Exhibition that was titled "Neue Heimat" & I had this incredible idea for a piece. 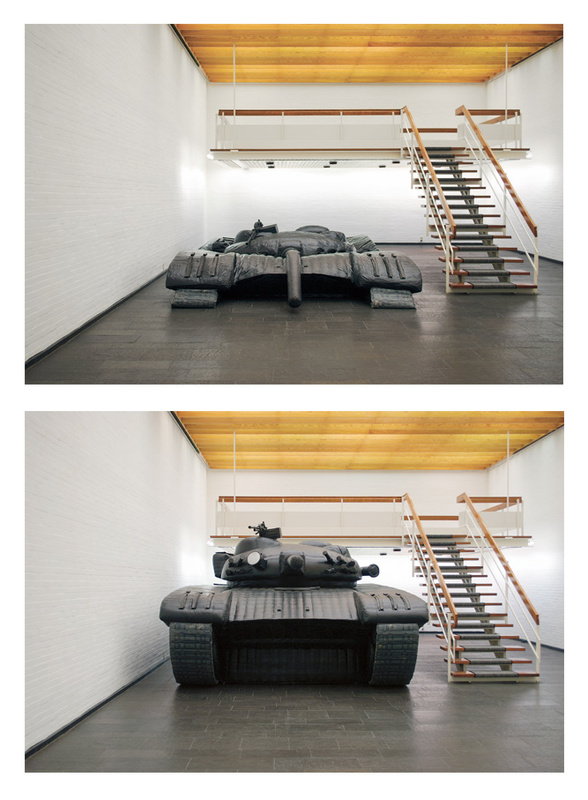 I had seen somewhere that these inflatable tank mock-ups exist. 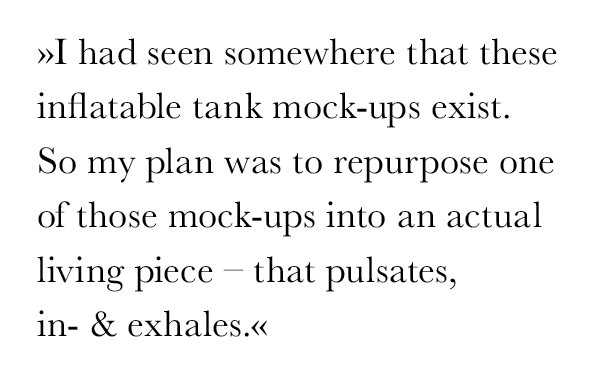 So my plan was to repurpose one of those mock-ups into an actual living piece - that pulsates, in- & exhales. So I bought one of those tank mock-ups at a Chinese company & remodeled it so that air is blown in and sucked out in minute to minute intervals. Envision this tank that keeps inflating and then almost implodes an instant later & that on heavy repeat. There’s definitely a bit of slapstick behind it - like a cannon that straightens upward to take aim but then just falters to the ground.